As we mentioned in our last blog post, spreading seed is an important part of fall lawn care. Throwing down some seed during the fall can help protect your lawn as the cool temperatures roll in and the harsh winter takes hold, regardless of whether you have bald spots and bare patches or not. And when your lawn stays strong and protected over the winter, the better the chance is that you will have a fantastic lawn come spring. Read on to learn more about overseeding, or contact us today to schedule this and other fall lawn care services. As the name implies, overseeding is the process of spreading grass seed on already-established turf. While overseeding is generally thought to be something that is only done when your grass is damaged or not growing very well, many lawn care providers recommend that you overseed your lawn at least once a year. Over time grass becomes weaker and can lose some of its thickness. This can lead to unsightly bare spots or bald patches that quickly get filled with weeds. 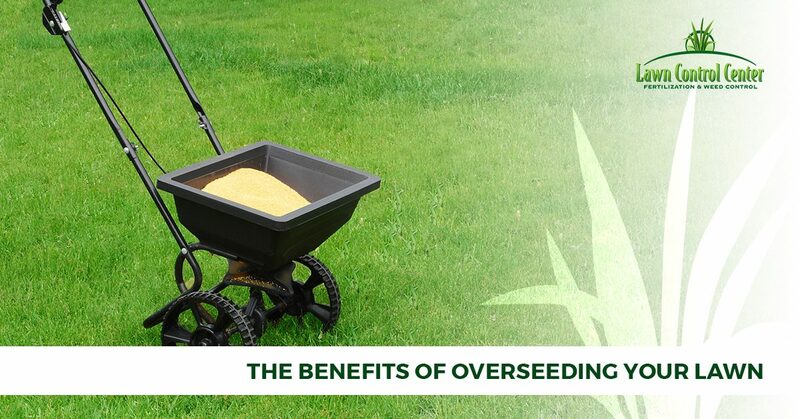 Overseeding fills in these spots and helps create a thicker lawn that is strong, healthy, and ready to handle foot traffic, natural weathering, and other stressors. By applying grass seed over an existing lawn, you can also strengthen your lawn, helping to prevent erosion. A densely packed lawn keeps moisture and soil where you want them. Additionally, an overseeded lawn can help lower the risk of pests and other lawn diseases. How Do I Prepare My Lawn For Overseeding? Cut your lawn, leaving about 2 inches of grass. After mowing, rake up and remove all the clippings. This step will help improve the chance that the new seeds are able to reach the soil and germinate in a timely manner. Rake dead or dying patches to help expose as much of the ground as possible. Patches of dead grass are not conducive to germination. Raking the ground will help increase germination rate. Test your soil and if necessary add fertilizer. Maintaining a healthy pH will make your lawn healthier and promote growth. After seeding, apply straw, peat moss, or some other product to help your lawn retain moisture and reduce the loss of the grass seed. If you have any problems with these steps or don’t have the time to perform all of these lawn care services, be sure to contact your local lawn care experts. Overseeding is certainly a potential DIY job. In addition to the previously mentioned tips, be sure to also buy the appropriate type of high-quality grass seed that works for your location — in Ohio, this will likely be a cool-season grass mix. Also, be sure to properly spread the seed in your area, as well as give your lawn the right level of moisture after seeding. Keep in mind that you should not overwater your newly seeded lawn, and if you experience a heavy rain after you overseed, this could wash away most of your seeds. If you feel unconfident in your abilities or simply don’t have the time to perform your own lawn care services, be sure to contact your local lawn care company. If you are in the Columbus or Cleveland area (view the counties we service), Lawn Control Center can handle all of your lawn care services including overseeding, lawn fertilization, lawn aeration, pest control, and more. Contact us today to get your free quote!